Our meat cases are loaded with all cuts of beef, pork, poultry, veal, and lamb. Don’t see exactly what you want? Our meat department is staffed with skilled meat cutters that are there to slice, cut, chop, or grind any cut of meat you desire. We freshly grind our beef in-store several times a day to ensure quality and freshness. If it’s in our case, we guarantee it was ground that day! We also offer over 20 varieties of thinly sliced meats for healthier meal choices, such as stir-fry. We carry over 60 varieties of hot dogs, fresh sausages, and smoked sausages such as Kielbasa, Chouriço, Linguiça, and Locanico – all great on the grill. Steaks, marinated meats, and chops are available in all sizes. 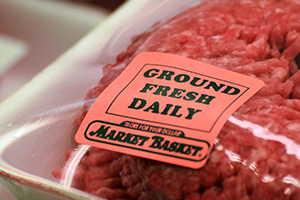 Of course, our fresh ground burger is a must-have for any BBQ! 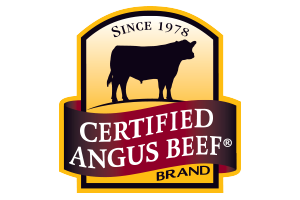 We carry Certified Angus Beef (CAB) in all of our stores. CAB is a premium beef that is a cut above USDA Choice. Only 1.5% of all beef in the U.S. qualifies to be Certified Angus Beef. CAB guarantees a flavorful and tender beef. Certified Angus will truly be the best-tasting beef you've ever had. Market Basket was awarded 2017 Retailer of the Year by the Certified Angus Beef council. Our 14 Butcher Blocks feature Certified Angus Beef steaks, chops, roasts, burgers, and marinated beef tips. 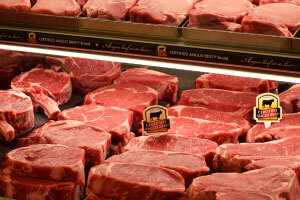 We also carry fresh – never frozen – American Lamb and Grade A Poultry. 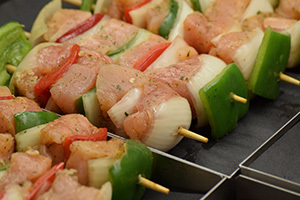 Ready-to-cook meats, such as stuffed pork and chicken, kabobs, and pub burgers, are always available at the Market Basket Butcher Block. Learn more here.